Back in the days of the PlayStation One or PSOne, an interesting game was released by Masaya Matsura called Parappa the Rapper which contained a 2D looking character in a 3D world. Our little hero had the ability to rap, dance and beat his way to victory through some of the strangest gameplay to have graced the day. It was totally Japanese and it was a hit! Years later, Parapa the Rapper returns on the PSP that once again promises the same thrills of yesterday, however with a 21st century makeover. Experience the Music Game that Started it All – Widely credited with introducing the music and rhythm genre craze on videogame consoles, this classic title offers a nostalgic game for true PlayStation fans and a fun and humorous adventure for a new PaRappa audience on PSP. Rap Head to Head Wirelessly - Play PaRappa The Rapper wirelessly for the first time! Discover who the real PaRappa master is with wireless head to head rap battles against up to 3 other PSP systems (4 total). 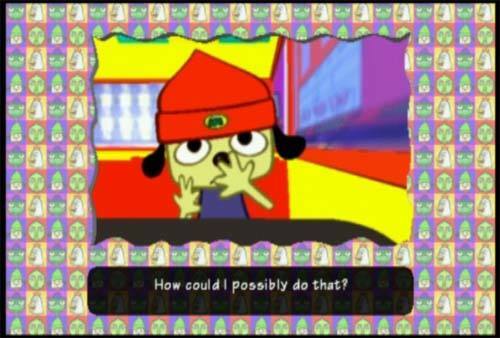 Game Share and Rap with 4 PSP Systems – PaRappa The Rapper allows players to wirelessly share a demo level with 4 PSP systems simultaneously. Share the fun with friends and play together. Download News Playable Songs – Expanding PaRappa’s hip-hop repertoire, players can download 8 remixes to play. Using PSP’s Infrastructure Mode, the remixes can be downloaded wirelessly onto PSP. Enjoy the Original Soundtrack – Rap to the timeless rhythmic tunes and catchy lyrics created by the gifted musician Masaya Matsuura, including Chop Chop Master Onion and Cheap Cheap The Cooking Chicken. PaRappa and the Colorful Cast of Characters – Enjoy 6 levels with Parappa and the rest of the colorful and flattened characters from the mind of famed New York artist Rodney Greenblat, including Chop Chop Master Onion, Instructor Mooselini, MC King Kong Mushi and more! 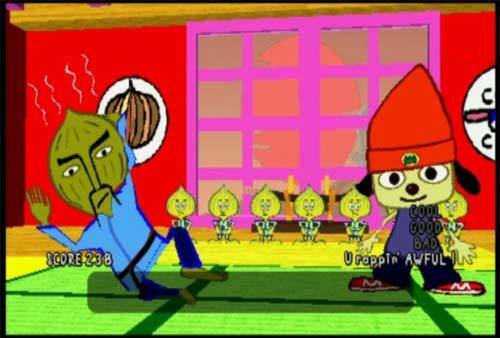 Graphical Presentation on PSP – Like the original, PaRappa The Rapper’s unique graphic presentation features two-dimensional flat “paper-like” characters that roam around an animated three-dimensional gaming world. Updated from the original, it has been reformatted to the PSP’s native 16:9 format. Timing Based Gameplay Mechanic - A “Simon Says-type” gameplay mechanic allows players to rap to the addictive music by timing button presses to the beat. In the title, Parappa the Rapper must win the hear of his friend Sunny who happens to be a sunflower, however unfortunately for our hero, another dog is in the house called joe Chin who also fancies our heroine. Fortunately for Parappa he is joined by a plethora of friends in order to assist them win the rapping competition and hopefully win the heart of Sunny. 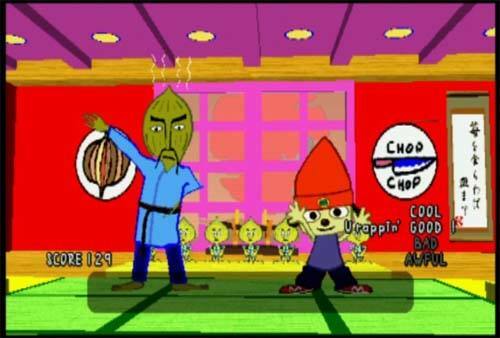 There are a variety of "missions" throughout the game such as Parappa trying to earn a driving license from Mooselini or Parappa taking kung fu lessons from Chop Chop Master Onion that does help break the monotony of the title. In its essence, the title is a memory game where the player must push the buttons with the right timing in order to pull off the moves. Ironically, the gameplay is almost identical to it was in the original game where the player must time their moves by pressing a variety of buttons by looking at the icon at the top of the screen. Fortunately another character will do the move before Parappa and then the player must mimic his movements. Needless to say, quite a frustrating experience if you do not have a handle on where all the buttons are on the PSP. The title also supports some multiplayer options that allows up to four players to rap against each other . Graphically, Parappa looks a little more refined since we last saw him and even though the graphics may look a little plain, the colours, background and characters make up for the lack of 21st century graphics. The music is great and the one-liners in the title does become a little repetitive but I'm guessing Sony is trying to recapture the magic of the original game which they do successfully. In conclusion PaRappa the Rappa is an entertaining game that I could easily recommend to the younger game or for those that want a blast from the past. Cute graphics, great sound and music and definitely a classic title!